Most would agree the Carolinas have had a bit of a rocky relationship. After all, sharing the Blue Ridge Mountains can lead to a lot of turmoil. Luckily, their separation was relatively amicable, and it seems they live side by side quite harmoniously today. North Carolina may be slightly larger in size, but South Carolina is richer in cultural history, and is largely recognized for what we think of as the quintessential South. South Carolina has a rich colonial history. This is especially noticeable in Charleston, which played an important part in the onset of the Civil War. In fact, the attack on Fort Sumter by the Confederate Army is what set the war off on April 12, 1861. Today, sightseeing boats are available to take visitors on a 90-minute tour of the fort, along the Cooper River to the Fort Sumter National Monument, while providing views of the war prison with insights and interpretations from knowledgeable guides to make the scenes of war come to life. However, even if you’re not a war buff, you can still see the roots of the deep south in Charleston. The over 2,000 plantation homes in Charleston are some of the state’s most stunning, with equally outstanding gardens surrounding them. The Magnolia Plantation features the last grand Romantic style garden in America, and the Boone Plantation is known for its three-quarter mile Avenue of Oaks. You’ll swear you can still hear the porch swings creaking in the distance. While South Carolina is known more for its battlegrounds than North Carolina, if there is one battle between the states that South Carolina wins hands down, it’s the one over the weather. South Carolina can be quite tropical in the summer, making the coastlines a major attraction. Perhaps the most popular and pristine beach in South Carolina is Myrtle Beach. Besides providing white sands and blue water, the beach is also home to the Myrtle Beach Skywheel and Carolina Opry. Broadway at the Beach is the state’s largest shopping, dining, and entertainment destination, featuring mini-golf, rides, and a pedestrian-only area around Lake Broadway for some fun and people watching. Plus, Myrtle Beach is also known as “the Golf Capital of the World,” so be sure to bring your irons! As for the Blue Ridge Mountains, North Carolina may have gotten most of those in the settlement, but you can still find the southern tip in Caesar’s Head State Park. For the best selfies, check out Overlook with its breathtaking view of Table Rock, and against the world’s largest waterfall at the end of Raven’s Cliff Trail. You’ll find plenty of fishing opportunities in the Blue Ridge’s many rivers, and hidden geocaches that can be located by GPS. When it comes to eating, South Carolina puts the soul in soul food. Most of the barbecue in SC is Eastern Carolina style. South Carolina is the only state with four distinct styles of sauces: mustard, tomato, vinegar, and sweet and sour. Sweet tea is the popular drink of choice, and is readily available throughout the state. So come to South Carolina for the taste of the true South, and be sure to bring your bathing suits, cameras, and appetites. 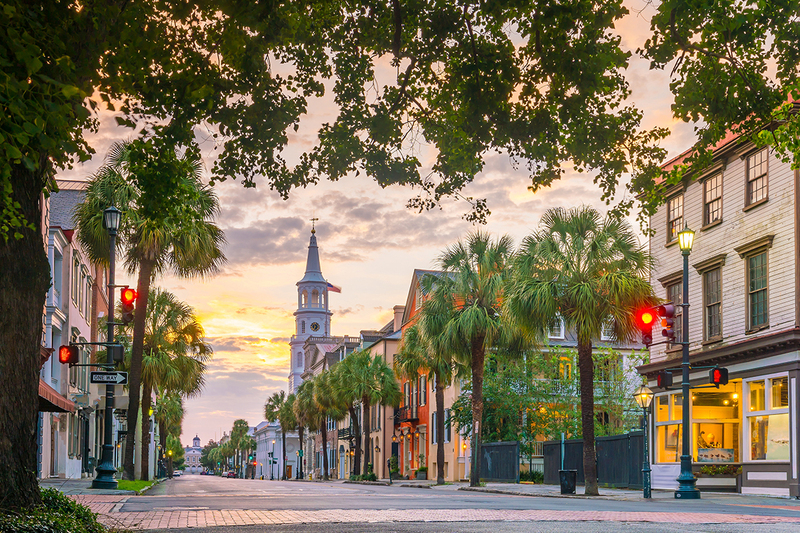 We have two Lavelier stores in Charleston, and both of them are located on King Street. After a sun-and-wave-filled day at Myrtle Beach and a cascading-waterfall view at Raven’s Cliff Trail, you’ll want to make a quick trip to Lavelier for some skin-pepping loving. Enjoy free product demonstrations, VIP facials, and exclusive package deals for new and regular clients.